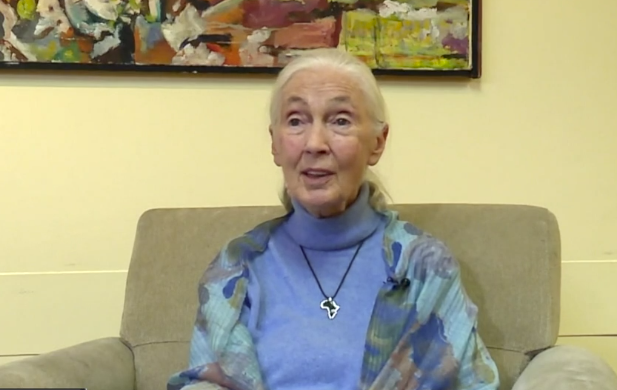 The iconic scientist and conservationist, Dr. Jane Goodall, wants everyone to know they can make choices that protect our environment. BOCA RATON, Fla. — Iconic scientist and conservationist Dr. Jane Goodall was in Boca Raton on Tuesday to speak on the importance of protecting species and the environment, while encouraging everyone to do their part. She wants everyone to know they can make choices that protect our environment. “The most important thing is for everybody to realize each individual matters and makes a difference,” she said. Goodall spoke to a sold-out audience at Florida Atlantic University Tuesday night and sat down with WPTV beforehand to talk about her research and legacy. "There's more awareness today about environmental problems. People think about all the problems around the world and they lose hope, and they feel there's nothing that can be done, so they become apathetic," she said. "That's the biggest danger." She's best known for groundbreaking field research into the behavior of chimpanzees. “I’m very happy that chimps helped me to provide information that helped us realize that we are part of the animal kingdom, not separated from it," said Goodall. She's spent the last 30 years as an activist, which stemmed from a conference she attended in 1986. The conference had a session about deforestation, the beginning of the bushmeat trade and other issues. “I went to that conference as a scientist planning to carry on with an amazing life, and I left as an activist," said Goodall. "Since October 1986, I haven't been more than three weeks consecutively in any one place, and that's only twice a year," she said. Now, Goodall, who turns 85 in a couple of weeks, travels the world with a message that applies to everyone. "If you start thinking about the consequences of the little choices you make each day, what did you buy? Where was it made? Did it harm the environment or animals? And you make ethical choices. If it's just you, it doesn't make any difference, but if it's hundreds, thousands, millions, billions of people making ethical choices each day, that’s when we really start to change the world," said Goodall.